Creating a User Profile is easier than ever and has several benefits. A profile grants you access to the Tethys Community, where you find contact information for other registered members to collaborate with your peers.You can also rate and comment on documents to provide useful thoughts and dialogue. Finally, you may suscribe to Tethys Blasts where you will recieve a bi-weekly email with updates on new Tethys material and events. Future planned features will include such benefits as job notifications for students, and more. 1. Click “Register”, found in the top right corner of the Tethys Home Page. 2. You will then be taken to a page where you can create a new account. Fields required for registration include username, password, email address, full name, and background, which you pick from a drop down menu. You can also fill out several additional fields, which will appear on your user profile page when you are finished. 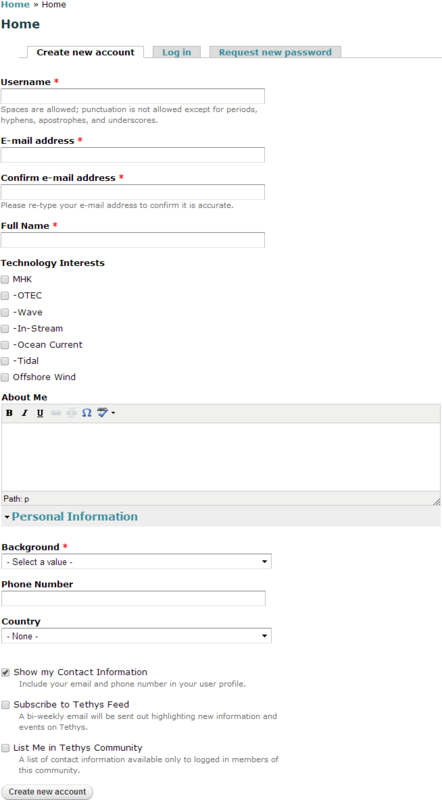 Lastly, there are several checkboxes at the bottom of the page: "Show my Contact Information" will allow your email to be shown on your profile, "Subscribe to Tethys Blast" will enroll you in a bi-weekly email about new Tethys information and events, "List me in Tethys Community" will include your email in the Tethys Community list, and "Interest in Recieving/Sending Job Applications" will eventually allow you to send or recieve job applications but is currently only to guage interest in this feature. 3. You will immediately be logged in and ready to go! Congratulations, you now have access to all the benefits listed above! If you should forget your password, clicking "Request new password" will send an email to your email address that provides a one-time login that allows you to change your password.